Designers of rugged military and aerospace systems continue to look to the commercial world for networking technology – leveraging available Ethernet switch chips to connect between processing modules and PHY devices to link systems over fiber-optic or copper cables. However, using the latest high-performance networking technology in deployed systems based on modular commercial off-the-shelf (COTS) standards isn’t always practical. While the latest commercial devices support IEEE standards for 100G Ethernet and beyond, based on 25G and 50G SerDes technology, OpenVPX systems using the standard MultiGig-RT2 connector have so far been limited to 10G SerDes signals. Designers using high-performance and feature-rich commercial Ethernet technology to connect their embedded systems can deploy a growing range of techniques for managing traffic flows on their networks. Faster networks can carry more traffic, from more sensors and applications, on a single link, but care must be taken to ensure critical data isn’t delayed or dropped. These trends – performance and convergence – are two of the most significant factors influencing today’s COTS networking designs. In the past, meeting the performance needs for defense electronic applications often necessitated the use of custom hardware and FPGAs. Today, the technical challenge faced by many designers is how to implement high-speed interfaces in board-and-backplane modular systems. Modular systems based on VPX backplanes have been proven and deployed using 10G and 40G Ethernet, but moving to 100G Ethernet and beyond will require the use of 25 Gbps or faster SerDes technology. The use of Ethernet at 10 Gbps and above has also driven a growing need for optical interconnect solutions. A wide array of commercial products is available for implementing optical links. However, no single approach has emerged as the de facto standard for rugged systems. As a result, few COTS products integrate optical interfaces, leaving integrators to convert from electrical to optical in their systems. Faster Ethernet links also mean it’s now practical to use a single network to carry data from multiple different systems over a single cable. Ethernet in aerospace and defense systems can now carry a mix of voice, video, and data from various sensors and applications. This “converged” network can replace multiple single-purpose cables, providing substantial SWaP benefits and increased flexibility when adding new capabilities to a platform. As network designers seek to transmit multiple sources over the same data pipe, a major concern is the potential for interference or contention that delay real-time traffic. For time-sensitive or safety-critical applications, deterministic performance may be essential. Faster networks don’t necessarily deliver lower latency for critical messages if ­less-critical traffic leads to network congestion. One solution for getting closer to real-time networking is to implement policies that ensure critical data has the highest priority. Another approach is to divide the network into fixed time slices where each application or host is given exclusive access to the network during its assigned slice. These methods can help provide service guarantees along with bounded end-to-end latency, including on networks that use standards-based Ethernet. Whether they implement the latest TSN standards or vendor-specific QoS mechanisms, today’s embedded switches can enable traffic from a variety of sources, combining mission-critical and latency-sensitive real-time data on converged platform wide networks. 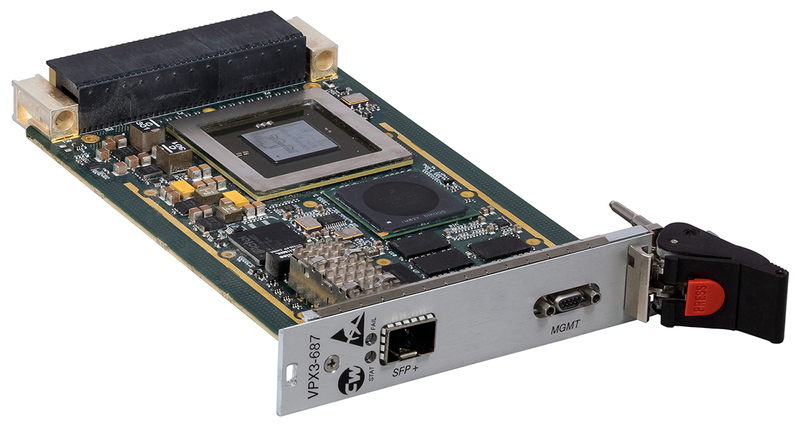 Curtiss-Wright’s VPX3-687 10 Gigabit Ethernet Switch – with support for gigabit, 10 Gbps, and 40 Gbps Ethernet – is an example of a high-performance Ethernet switch designed to connect the next generation of 3U OpenVPX systems. (Figure 1.) It provides switching throughput of up to 320 Gbps and full line-rate forwarding of up to 32 by 10 GbE or 8 by 40 GbE interfaces. Its nonblocking architecture is suitable for low-latency control plane and high-throughput data plane applications. Figure 1: The VPX3-687 is designed to connect the next generation of 3U OpenVPX systems. Andrew McCoubrey is the product marketing manager, switching and routing solutions, for Curtiss-Wright Defense Solutions.